Moscow’s military-technical cooperation with both New Delhi and Beijing does not allow Russia to stand apart from Indian-Chinese disagreements. On the other hand, successes on the diplomatic front were tarnished by a three-week standoff between India’s and China’s armies at the Chumar border crossing (in Leh). The conflict may have been heightened by Xi Jinping’s appeal to the commanders of China’s People’s Liberation Army on September 22, when he called on the army to be ready to “improve their combat readiness and sharpen their ability to win a regional war in the age of information technology.” On September 26–27, the sides withdrew troops to the positions they had occupied until September 1, and as such restored the status quo in the disputed area of the India-China border. Without elaborating on the details of Indian-Chinese relations, two particularities need to be stressed. 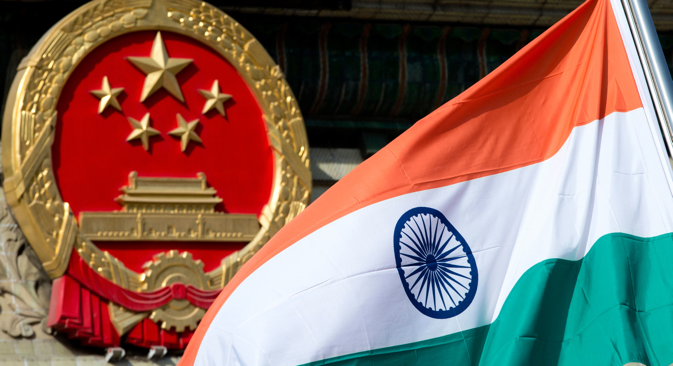 In the long term, China remains a key trading partner for India. According to India’s Commerce Ministry, in 2013–2014 bilateral trade between the two countries was $65.9 billion. Russian-Indian trade lags behind these figures, with the figure being around $10 billion in 2013. Xi Jinping’s visit demonstrated that India and China intend not only to halt the decrease in trade figures that has been seen in the last two years, but also to give a strong jolt to trade and economic ties. The development of political and economic relations between New Delhi and Beijing does not rule out acute security crises. The most likely ones are aggravated border conflicts. In proportion to the development of the navies of both countries, conflicts in the Indian Ocean can also be expected. India recently reacted cautiously to the docking of a Chinese submarine in Sri Lanka on September 7 to 14. Without a doubt, India and China will try to avoid an escalation of security crises in order to keep such crises from hindering the development of trade and economic ties. However, there is also no doubt that both countries have too many reasons to worry. On the Indian side, these reasons include not only China’s territorial claims, but also China’s potential regarding nuclear forces and general-purpose forces. India cannot help but be wary of China’s cultivation of military-technical cooperation with its neighbours, first and foremost Pakistan and Bangladesh. In New Delhi, there are also questions being raised about the nature of the military cooperation between China and Russia. In 2013, exports to China of Russian goods and services through the military-technical cooperation exceeded $1.8 billion (11.5 percent of Russia’s $15.7 billion total military-technical cooperation with foreign countries that year). India paid particular attention to two pieces of news on this front: first, in 2012, Russia and China signed an agreement to supply Amur-1650 class multipurpose submarines; the value of this contract was at least $2 billion. Second, the supply to China of C-400 air defence systems was approved. This decision came to light shortly before President Vladimir Putin’s visit to China in spring 2014. India’s concern about these systems is partly groundless. China is interested in the Amur and C-400 with regard to the situation on its eastern, not its southwestern, borders, and around Taiwan and the disputed islands in the East China and South China Seas. New Chinese multipurpose submarines will probably be deployed in this region. The C-400 systems will likely be deployed on the Taiwanese side. However, India’s misgivings about the development of Chinese-Russian military-technical cooperation should not be completely dismissed. First, China is free to change the deployment of the weapons and military technology it purchases from Russia. In the media it is impossible to find any references to China’s guarantees not to use against India goods and services received as part of the military-technical cooperation with Russia. Such guarantees probably do not exist. Second, China is free to transfer to third countries military technology acquired as part of the cooperation with Russia. For example, in an interview with a Russian newspaper during a visit to Moscow in May, Pakistan’s defence minister, Khawaja Asif, confirmed that Pakistani military pilots were familiar with Soviet and Russian technologies thanks to Pakistan-China military-technical cooperation. Can Moscow promise New Delhi that Russia and China’s new defence contracts will not result in modern military technologies’ falling into the hands of China’s allies surrounded by India? Moscow cannot make such a promise, not because it does not want to, but because after transferring military technologies to China, Russia is left with either too few or no mechanisms to monitor the subsequent fate of these technologies. Moscow’s military-technical cooperation with both New Delhi and Beijing does not allow Russia to stand apart from Indian-Chinese disagreements. Russia is actually exerting an influence on the balance of power between India and China. This influence is far from being resolved, but it must be reckoned with in both New Delhi and Beijing. Furthermore, Beijing might have many more reasons to worry than New Delhi. After all, the volume of military-technical cooperation between Russia and India is significantly larger than the volume of weapons trade between Russia and China. In 2013, Russian exports to India through the military-technical cooperation amounted to $4.8 billion (30.6 percent of the total amount of Russian military-technical cooperation with foreign countries). Russia is cooperating with India in domains in which there is no partnership with China, such as missile production, the construction of nuclear submarines, aircraft carriers and so on. The Russian-Indian military-technical cooperation has two distinctive features that are unacceptable when it comes to cooperation not just with China, but with any other country. First, Russia is willing to develop with India projects that have strategic significance (for example, cruise missiles and nuclear submarines). Second, both countries are interested in jointly developing and producing military technologies. In Moscow, it is widely agreed that moving forward, these two features need to be highlighted in the development of the military-technical cooperation with India. The successful development of Russian-Indian relations in this area is one of the conditions for erasing India’s concerns about Russia and China’s military-technical cooperation. The next steps may include other conditions. Russia could reassure India that within the context of the Russian-Chinese military-technical cooperation, technologies with strategic importance will not be transferred to China. Russia could insist on China’s strict adherence to a prohibition on transferring Russian military technologies to third countries. Russia, India and China could initiate an intensive program of trilateral military exercises that would help bolster trust among the armed forces of the three countries. Russia’s status as a supplier of military products and services to both India and China could be something other than just a reason for the anxiety of New Delhi (regarding Russian-Chinese ties) and Beijing (regarding Russian-Indian ties). This status gives Russia the potential to play a more visible role in stabilizing relations between India and China. However, the main role in this will always be played by India and China. Petr Topychkanov is an associate in the Carnegie Moscow Center’s Nonproliferation Program.